Good afternoon to all my wonderful followers! Today is another great giveaway sponsored by Lacy Laura Gray in honor of breast cancer awareness month! Have you checked out the recent post on how to volunteer/get involved with breast cancer organizations? 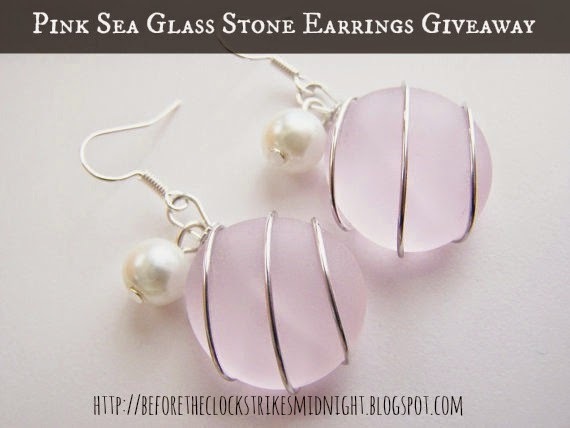 The winner of today's giveaway will receive one pair of pink sea glass stone earrings-so gorgeous! One of my other favorite items from Lacy Laura Gray's shop is the Leaf Skeleton earrings. Oh my gorgeous! Cute earrings with a low price tag. I love saving money, especially on jewelry. The winner will receive (1) pair of pink sea glass stone earrings from Lacy Laura Gray. Anyone wanting to enter must live in the United States. Refer to the giveaway for details on the opening and closing dates. The winner is chosen randomly and will be announced two days after the giveaway closes. I love the After the Rain - splashed porcelain earrings with the green color! I like the Sugar Skull Earrings ! CONNIE SOWARDS commenting: I like the Bahama Blue earrings. Beautiful! Thanks so much for linking and come back Monday! I adore the whispering violets earrings. Beautiful. I love the Something Blue - Sea Glass Necklace. So beautiful!